It didn’t take long for my initial excitement over having a decent-sized garage turn into my other primary emotion: Never satisfied. Looking at my 52-year-old garage floor makes you wonder what people have been doing in here? Or maybe it’s just the nature of cement or concrete, or whatever it is? Parts of it look like powerful acid was spilled on it, other parts like a massive oil spill (I’ve been known to add two quarts of fresh oil to the Chevelle myself, in my dad’s garage, before realizing as my feet began to slither that the sump plug had not been replaced): Other parts look like bonfires had been used by native peoples for cooking since antiquity, who knows? A Home Depot “epoxy paint system” looked like the cheap way to go, but everybody I asked said don’t do it. The online reviews are equally negatory. I hate messing with the chemicals and things you use to prep the concrete, and having to leave all your stuff outside for two or three days while paint dries is no good, either. Having your concrete polished is the latest cool thing, but that seems to be a job for professionals, and professionals cost money. You’d also have to completely empty your garage to do it right, and I really didn’t want to yank out all the built-in shelves and especially not the stuff that’s on them. Cheap vinyl tiles? No. Mexican pavers? Too much like work. Carpet? A little too bourgeois even for California. A little procrastinatory Googling one day turned up RaceDeck. 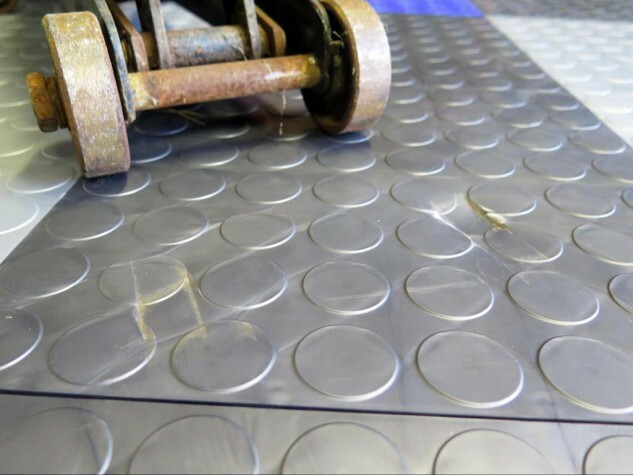 These are 12-inch square x ½-in thick plastic tiles that lock positively to each other via four male/female locks per side – a system RaceDeck says it’s perfected over 40 years. 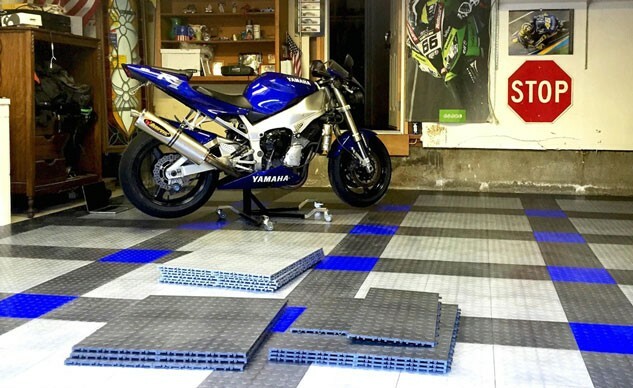 The matrix substructure beneath each tile lets air flow and acts as insulation, and RaceDeck says the tiles can support vehicles up to 80,000 pounds – also big tool chests, etc. It’s also supposed to be impervious to oil, gasoline, beer and all your common garage fluids. 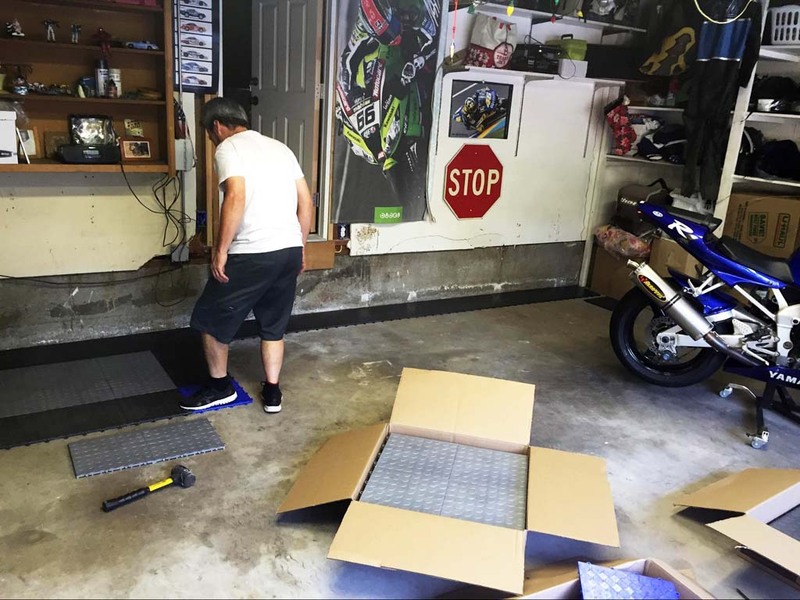 RaceDeck has a great website, with an online design function that lets you enter your dimensions, then make your own design within it however you want, using tiles in 12 colors and eight embossed patterns (the H-D bar and shield is one of them; we chose CircleTrack). There actually is SnapCarpet too, along with tiles that let water drain through toward a floor drain if you live in a wet place. A little quick work with a measuring tape told me I needed a 19- x 17-foot rectangle, since I didn’t want to go all the way to the edges of the garage (and If I ever do tear the old shelves and workbenches out later, I can order more). I liked the pattern under the Porsche on RaceDeck’s home page – graphite, alloy and a little blue – nice and soothing, and punched it into the online ordering template. Really simple. Three or four days later, a truck pulled up and unloaded a pallet of seven or eight boxes of flooring. It was hard for me to wait for the big L-shaped sectional sofa, and the lout upon it playing video games, to move out of the garage and back to college so I could get to work. Say, this is easy. The tiles come packed in 2- x 2-ft, 4-tile sections. Once we cleared a bunch of other junk out of the way and prepped the floor (by sweeping it), it was time to dive in. I pulled up the original pattern on my laptop to decrease our chances of screwing it up, and my pal Jim and I got to work. You really couldn’t call it work, though, more like a couple of kids putting a big puzzle together while we listened to the radio and made sure to stay hydrated. Same-colored tiles come out of the box four at a time in 2- x 2-foot sections, which are easy to take apart by snapping over a knee. Connecting tiles to each other on the floor is easy with a rubber mallet or your shoe. You could even lay RaceDeck while on powerful hallucinogens if it came to that. With both of us laying tiles at a totally leisurely pace, the thing was done in about three hours, and I really couldn’t be happier with the finished result. Okay, I could be a little happier: Heavy, concentrated loads like the ones imposed by floor jacks and jackstands will deform your RaceDeck. On the other hand, the slight plasticity means it feels much nicer underfoot than bare concrete, and no, it doesn’t squeak at all when you walk on it. You will need to put something under the wheels of your floor jack to spread the load if you’re going to be lifting 4000-lb automobiles and things. Happily, it’s easy enough to pry up one tile and replace it. 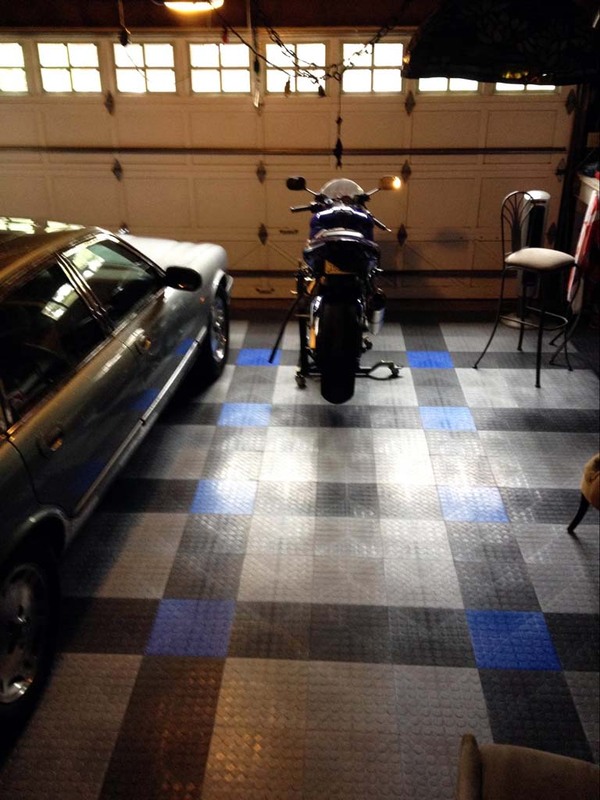 The problem with this sort of thing is now that the floor looks so nice, it highlights how terrible the rest of the garage looks, and therefore the work is never done. At least the flooring part was super-easy if not exactly cheap: RaceDeck sent exactly 323 tiles in three colors, as ordered, and when we got to the garage door opening and realized we’d done it backwards and needed 17 male edge pieces instead of female ones to put the finishing touch on the job, a quick email had them here a few days later from RaceDeck HQ in Salt Lake City, Utah. The company’s customer service seems as impeccable as the product. 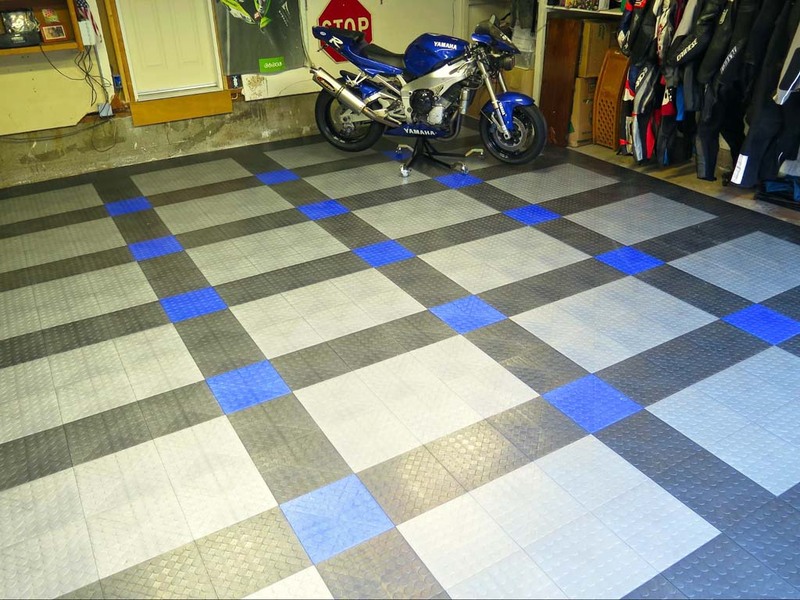 Prices vary depending on the tiles selected from RaceDeck. Our selection wound up being right around $3 per tile, which includes a 20% discount for belonging to one of a long list of online forums. Volume pricing applies to people with really big garages. 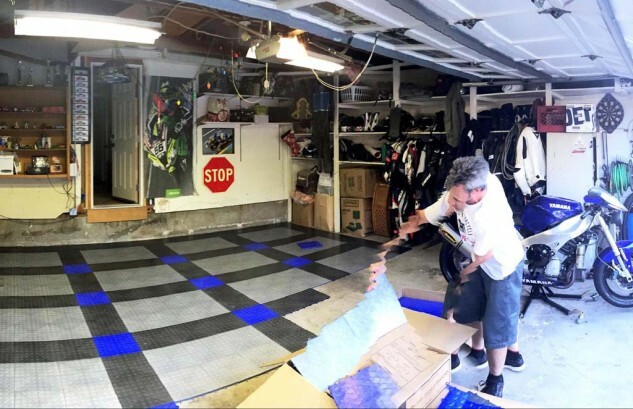 Overall, this wasn’t the least expensive garage floor solution, but considering the ease of installation, the almost limitless design possibilities – not to mention the portability of this floor (God forbid we have to move again anytime soon) – I’d recommend this product to just about any garage monkey. I think I raised the property value of my whole street.